What the bosses saw. The view from inside TYS landromat of the solidarity delegation that accompanied the two TYS workers when they presented their demands. | Liberation photo: Sophia Roberts. Minimum wage. Overtime pay. Appropriate protective gear. 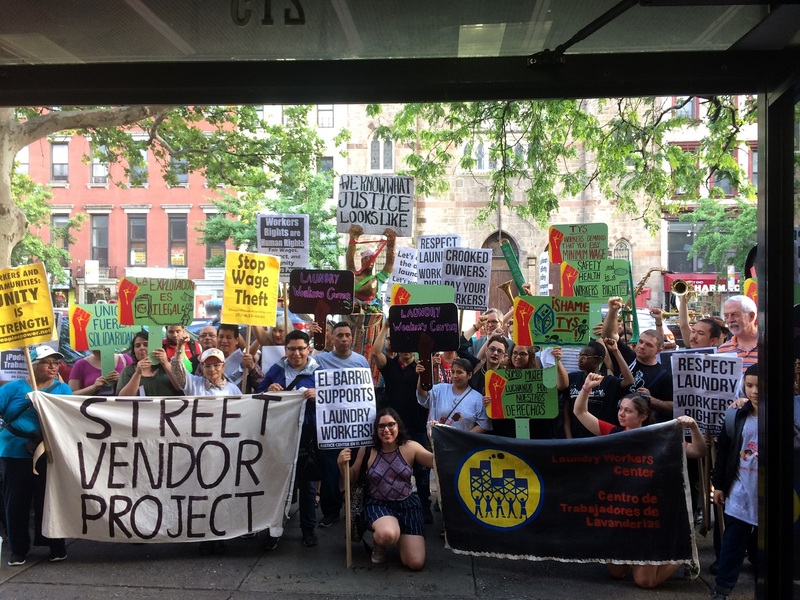 These were the demands that workers at TYS Laundromat in East Harlem fought for – and won. At an Oct. 5 gala for the Laundry Workers Center, the organization that provided support and training for this campaign, there was much to celebrate. Juana (who declined to give her last name to maintain privacy) and Nicholas Benitez, the two workers from TYS, were honored for their courage in putting their jobs on the line in order to fight for their rights. This moment was only one snapshot of the work of the Laundry Worker’s Center, a not-for-profit, member-led organization. After the gala, Rosanna Rodríguez, the group’s co-director, sat down with this reporter to talk about the founding of the center, the important struggles that came before the Laundromat Campaign, and the next steps LWC will take in its mission to transform the laundry industry and the lives of the workers and community members involved. Rosanna Rodríguez, co-director of the Laundry Workers Center. | Photo: Laundry Workers Center. 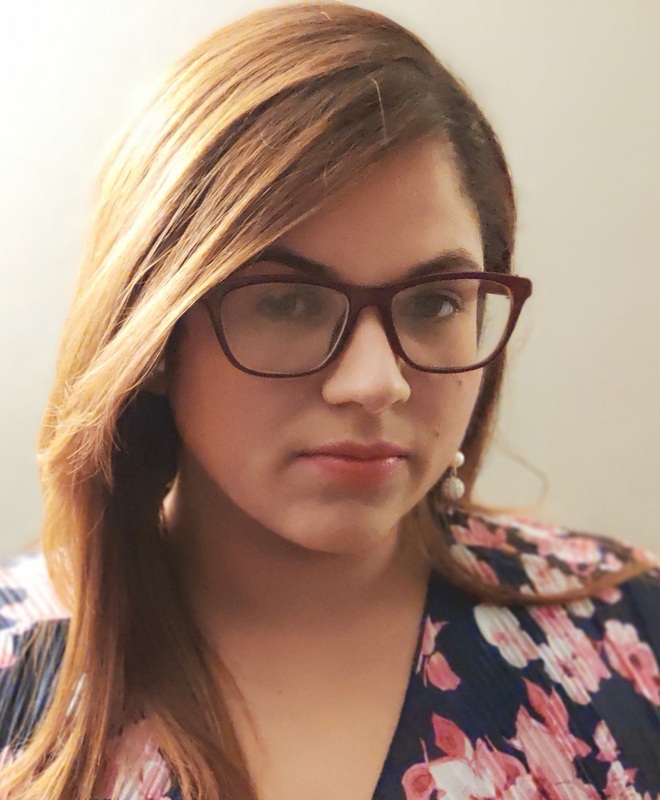 Rodríguez, an immigrant from the Dominican Republic, became interested in community organizing and social justice by working with young people in her home country. After coming to the U.S. and working for a non-profit organization that supports restaurant workers, Rodríguez noticed the lack of support for laundry workers. “We wanted to create something different,” said Rodríguez. “We wanted to make sure that the voices of workers would be heard.” She co-founded the Laundry Workers Center in 2011 in order to organize laundromat workers in New York and New Jersey. But organizing laundromats was not easy. As Rodríguez recounts: “There were a lot of challenges. The workforce is very small. In the majority of the laundromats, you have two, three, maybe four workers. It is labor-intensive – going laundromat by laundromat to organize the workers.” Furthermore, many laundromat workers are immigrants, some without documents, and primarily speak languages other than English. 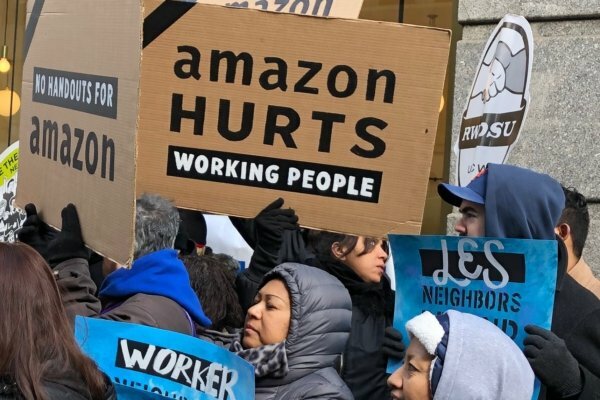 Rodríguez realized that in order to address these challenges head-on, a workers’ center, rather than a union, would be the most flexible model. She explained that while a union serves as a legal representative of groups of workers in collective bargaining, a workers’ center can offer different kinds of support. For example, a workers’ center can help low-wage, immigrant and/or undocumented workers who are not in a union or are excluded from federal labor laws. 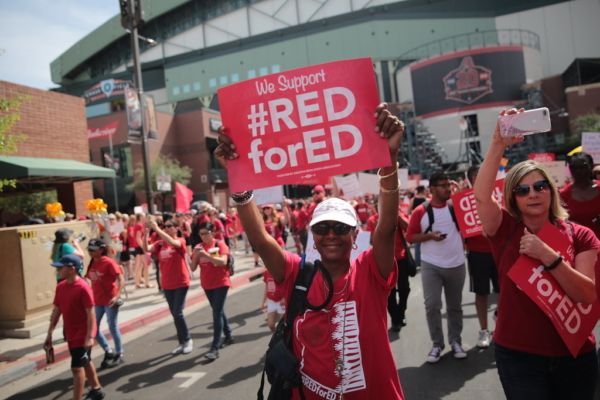 Workers’ centers can also use certain tactics, like secondary picketing, which are often illegal for unions. 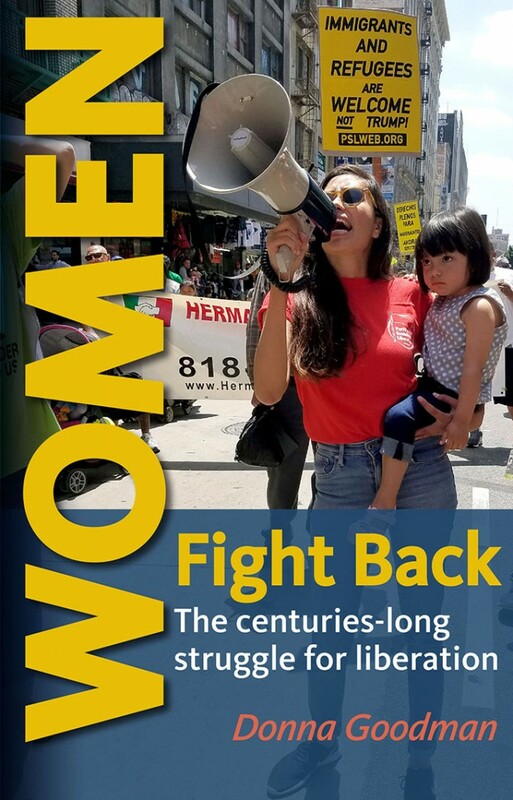 Although the original focus of the LWC was laundromat workers, this changed after they were approached by restaurant workers looking for support (including Mahoma López, who is now co-director with Rodríguez). “We decided to expand from laundromat workers to restaurant workers and now we also do warehouse workers. We work with low-wage immigrant workers and we need to support them,” Rodríguez added. Many of the early LWC campaigns required a variety of tactics. In their first campaign at a Hot and Crusty restaurant, the LWC supported workers seeking better terms and conditions of employment by forming their own independent union. As Rodríguez recalls: “It was our first campaign, but it was really powerful how the workers fought until the end. Even though the company tried to close, the workers formed an independent union, occupied the workplace, and stayed outside the workplace for 52 days.” The film “Hand that Feeds” documents their historic wins of a three-year contract with better benefits. 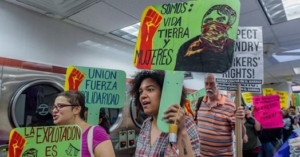 The Laundry Workers Center practices direct action. Here, supporters marching and chanting inside the TYL laundromat. | Photo: Laundry Workers Center. After organizing over 200 workers at B&H Photo, LWC is now back to its original mission. “We never forgot about laundromat workers but were busy working with other workers in the restaurants and warehouse industry. The laundromat industry is still there and nobody was organizing it. So we wanted to come back and really focus our energy there,” Rodríguez stated. Juana and Benitez were the only two workers at their 24-hour laundromat, regularly working 12-hour shifts. 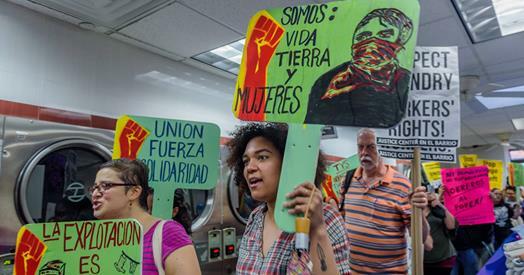 They launched the Laundromat Campaign by holding a loud and colorful rally in Jefferson Park, alongside almost 70 community allies and friends, including comrades from the Party for Socialism and Liberation and support from the Laundry Workers Center. The group marched to TYS laundromat, where they displayed signs and played instruments while walking through the premises. Finally, Juana and Benitez presented their demands for fair and timely pay and protective gear to the owners, to the cheers of the crowd. The owners initially agreed to the demands. Volunteers accompanied the workers to their shifts the next morning to prevent retaliation. While the owners later tried to backslide, continual pressure from the workers and the center helped secure their gains. However, the fight will continue – workers are now entering negotiations for the back pay they are owed. Along with the campaign at this laundromat, the LWC spent two-and-a-half years putting together an extensive report on the state of workers’ rights in the retail laundry industry, collecting approximately 100 surveys from 78 different laundromat locations. Among many other things, the report found that one-in-five laundry workers were expected to pay out of pocket for protective gear they needed to do their job, more than half the workers experienced some kind of harassment on the job, and more than a third reported not being paid or being unpaid for overtime work. The LWC has distributed the report to over 300 workers. They plan on doing further outreach to 200 laundromats in the next year, surveying up to 180 more workers. They have three tentative upcoming campaigns, including one in Queens. They are also planning to participate in a year-long task force with partner groups such as Worker’s United to submit recommendations for a citywide law to raise the standards in the entire laundromat industry. But, according to Rodríguez, in order to accomplish these ambitious and important goals, the Laundry Workers Center needs your help. “We love to have new allies that can support us in this coming campaigns. So if people want to volunteer or put their bodies in the street, that would be great. Also if people want to support with resources or make a donation, that is really key for us.” Join the Laundry Workers Center in their struggle by visiting the websites below!